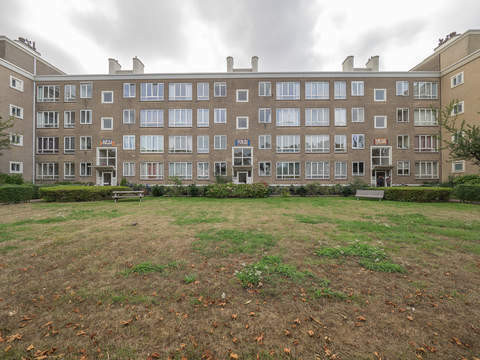 Pomonalaan 49 Price asked € 420.000 k.k. With an eye for detail renovated 5-room ground floor apartment with 4 bedrooms, kitchen and spacious back garden with back entrance and bike storage, on beautiful location with unobstructed view at the front and rear. Front garden paved with rubble stones, entrance apartment, vestibule with granite floor and wall tiles, draft door to a spacious hall with marbled paneling and herringbone parquet flooring, 2 cupboards. Old style tiled toilet with hand basin. Spacious and charming room en suite approx. 12.44 x 3.79 partly 3.29 also with herringbone parquet floor, bay window, separation of 2 cupboards and storage space. In the dining room is the kitchen situated and adapted in style of the 30s with coil island with dishwasher, kitchen unit with induction hob, oven, display cabinet, fridge/freezer and the worktop is black/gray composite. Bedroom at the back approx. 3.55 x 2.25 with cupboard, master bedroom approx. 4.66 x 3.33 with cupboard, modern intermediate bathroom approx. 3.47 x 1.83 with walk-in shower, bathroom furniture, underfloor heating and cupboard with connection for washingmachine-/dryer. The bathroom is accessible from the master bedroom and the hall. Bedroom in front approx. 4.03 x 2.50 with cabinet wall and second bedroom approx. 3.95 x 2.02. All rooms at the back have access to lovely spacious garden approx. 8.11 x 9.90 facing northeast with a raised terrace, storage space and back with bicycle storage. Eternal lease-hold land. The rent charge is for the apartment € 1,068.20 per year, based on a land value of € 34,457.60 (= redemption) and a rent rate of 3.1%. For the storage € 12.26 per year + 2x € 25.-- = € 50.-- per year management costs. Review rent rates by 1-1-2022. 303/1000th share in the community. Active Owners Association, contribution € 67,-- each month. Electricity 10 + 2 phase groups with circuit breaker. The apartment at the front is equipped with aluminum frames with double glazing and at the rear with wooden window frames with double glazing and skylights of stained glass. Living surface approx. 123 m². The volume of the apartment approx. 457 m³. Shops at het De Savornin Lohmanplein, Fahrenheitstraat, Goudsbloemlaan, Weimarstraat, Vlierboom- en Appelstraat. Public transport (RandstadRail Line 3, Tram 12 and bus 22 ) and main roads through Westland Road and Hubertustunnel.